"So how do you know the difference between preparing and over-preparing?" First of all, here's what it looks like to be unprepared. I've also written several posts about how I and others prepare. I've read lots of articles that say you can never be too prepared, or that it's better to over-prepare. I disagree. 6. You've got a plan B for possible mishaps with your computer, props, handouts, flip chart, etc. 6. 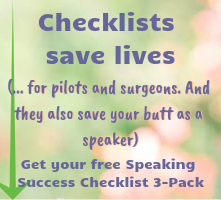 Hours before the presentation, you're still rewriting and reorganizing your talk, under pressure because you want it to be "perfect"
Go get my free checklists to help you with your preparation! 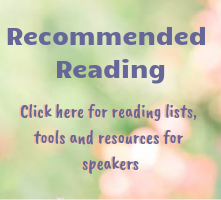 Lisa - Thank you so much for publishing this list. I was actually worried about being too prepared for a presentation I had to give today, but upon reading this, I realize I had no reason to be. I ended up just about memorizing the opening and closings (not quite word-for-word, but close) and transition points. I didn't finish the slides until last night... but I was pretty close about two weeks ago. From that, I rehearsed 4-5 times, paying special attention to problem areas that made the flow awkward. 9 and 10 were very valuable. My wife made me do 9, though, correctly pointing out I'll be less stressed about the presentation if I had a good night's rest before. I know I ended up making a few mistakes that I wished I could have had back, but from reading your blog and taking your course, I knew that my audience wanted me to succeed. I can't thank you enough for teaching me that. Cam, I'm so glad your presentation went well! Realizing that your audience isn't secretly hoping you fail is a huge confidence boost - if you retrain your brain, that is, with some visualization and positive self-talk! The good thing about making mistakes is that you survive. And coming out the other side by handling mishaps with grace and humor, you find that nothing really truly bad can happen while you're speaking. You know you're prepared when you feel comfortable and relaxed when you hit the stage. You know you've over prepared when you haven't slept in 3 days thinking about making everything perfect. Jacki, I would also say that, along with being comfortable and relaxed, I'm excited and fired up when I hit the stage! Not so when I'm under- or over-prepared! Cam, you've inspired me to add something about feeling strange doing positive self-talk to one of the videos in the new e-course. . .